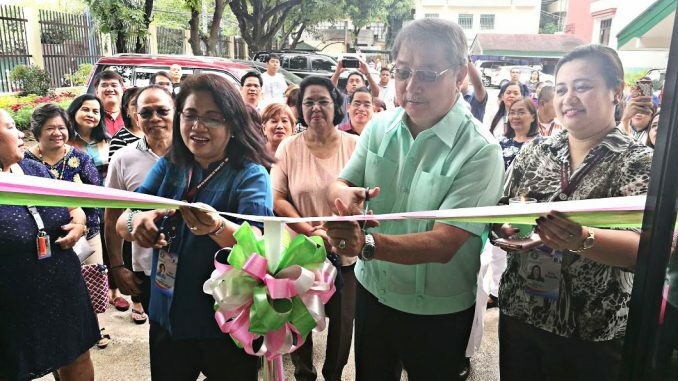 The blessing ceremony of Schools Division Superintendent and Assistant Schools Superintendent’s Offices and the Division Learning Resource Management and Development System was held on July 27, 2018 in the presence of Mayor Antonino G. Calixto Jr, Dr. Evangeline P. Ladines, SDS and Dr. Melody Cruz, OIC-ASDS who assisted Mayor Calixto in the ribbon cutting ceremony. Division of City Schools’ supervisors, school heads and personnel witnessed the said event. The cutting of the ribbon marked the opening of the new offices for enhanced public service. The blessing was followed by a feast enjoyed by everyone. It took a six month-long construction and renovation of the offices in order to have conducive space for the heads of the organization and eventually accommodate its clientele. Prior to the said blessing, a mass presided by Father July of Sta. Clara Parish was held at the SDO, Conference Hall. In his homily, he emphasized the importance of humility among other virtues. He encouraged everyone to be humble as well as strengthen the relationship by showing compassion, kindness and forgiveness to colleagues. Meanwhile, Congresswoman Emi Calixto Rubiano spared time to show her full support to this endeavor. Dr. Loreta Torrecampo and Dr. Helen Grace Go, SDS of Las Pinas and Malabon City respectively joined the blessing. Councilor Joey Calixto and other guests also graced the event.